← What Should We Teach Children About Cat Ownership? Why did Flickr suddenly change the design and layout of their website? This is a longstanding website owned by Yahoo. It was probably the premier photo hosting website in the world. It had a huge following. Many account holders are intelligent people drawn to what was the functional and efficient layout with plenty of opportunity to add text. Flickr was more than a website that hosted people’s pictures. It was a community of people. The communication was through picture and word. These were loyal members of Flickr. They feel betrayed by the change in layout which has almost universally been regarded as a failure. The question is, is it a failure from Flickr’s point of view. Why did they change things? Flickr was losing ground to Pinterest. Pinterest made a big band entrance to the internet. It was bound to because the whole Pinterest edifice is built upon copyright violations. Anyone can post anything on Pinterest from any website, which means the pictures are bloody marvelous. There are tons of stunning photos on Pinterest, whereas on Flickr the majority are amateur snapshots amongst which are some stunners. Flickr is real and proper. Pinterest must delete thousands upon thousands of images every week or day because people complain about intellectual property abuses. What I am saying is that Flickr were No.1. Their position was usurped by Pinterest and they want to reclaim it. They would have achieved that in time if they’d kept their cool. Instead they panicked and tried to make their site hip and cool; suited to younger surfers while betraying longstanding loyal account holders who don’t want to be hip and cool. They just want to be good. That is what the founder of Wikipedia, Jimmy Wales, says about Tumblr, the website recently acquired by Yahoo. The reason for the purchase: Yahoo want to be cool and hip; more modern. In that blind chase for modernity Flickr are bleeding account holders, the people who made them the premier photo site in the first place. This is not good customer care. It is arrogant and it has upset many people. The general reaction from Flickr members is one of anger and disappointment. They are unhappy with the changes. They feel they have been let down. I am member of Flickr and I can categorically say that the new design and functionality is worse than the original. It is slower and harder to navigate. The image thumbnails are much larger and the text element of the site – the comments and conversation – is pushed to the background. It actually looks a bit like Google Images. What conclusion do I draw from this? Yahoo wants to be more hip and modern. It wants to revamp its image, perhaps targeting the younger internet market. In changing the design and layout of Flickr they have not achieved this. Instead they have alienated its core members and Flickr’s standing will continue to decline as a result. Flickr’s Alexa ranking continues to drop (see header image). In fact, the fall has accelerated since the changes. 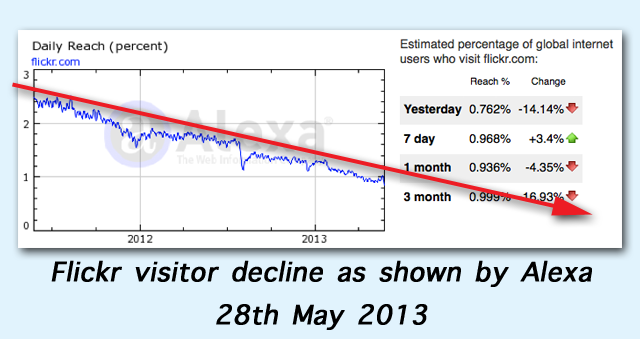 Alexa is a website that measures the amount of visitors to websites and how much time etc. they spend on the site. Flickr should reassess what they have done and listen to the people who really know best: its customers. This entry was posted in Cats in art, photography, Human to cat relationship and tagged cat photography, flickr by Michael Broad. Bookmark the permalink. If everyone obeyed copyright laws Pinterest wouldn’t be such a competitor to Flickr and perhaps the changes would not have been implemented. You can use Pinterest without violating copyright, but most people don’t care. Well said. Pinterest could be and should be entirely legal. That is what they say they want but they don’t care. It is down to people whose copyright has been violated to complain. That puts the work in the wrong place. Pinterest should prevent people uploading copyrighted material to their site. Google are also in the wrong because they support Pinterest by finding it so prominently and also Google image search is consistently in breach of copyright by presenting the pictures on their site. I noticed the deterioration in Yahoo Mail quite some time ago after it was announced that a lot of the regular staff had to go. The new Yahoo Mail is no better than the classic and many people say it is worse and slower. Many of the chronic problems persist, like switching from one text size to another, and flopping from bold letters back to standard without selecting it, etc. It’s legibility is pathetic with spidery letters that don’t have enough contrast. Only Facebook is worse than Yahoo for legibility. Much worse. I guessed they prefer to employ a load of cheapies and get rid of the the high salary high capability old timers. We are now seeing the results of getting in a bunch cheap smart alec schoolboys to save money and they are ruining both Yahoo and Flikr. OK but is the boss asleep? I think the boss is screwing up basically. Yahoo overpaid for Tumblr by a considerable margin – a billion dollars (usd). Earnings at are Tumblr poor. I didn’t know that Yahoo mail had deteriorated and now Flickr. Flickr really was a good site but now it is less good. You could be right about the quality of employee because technically Flickr is less good than it was before the change. It is sad and disappointing.